Finally, the travel companion you've been looking for! The best selling military deployment bag is now at your fingertips. The Code Alpha Tactical Gear Mini Monster Bag is the only wheeled luggage bag you'll ever need. Perfect for flying, this deployment Bag from Code Alpha Tactical Gear is equipped for comfortable rolling on its three oversized ball bearing tractor wheels or carrying with its reinforced handles. The Mini Monster Deployment Bag is constructed with splash resistant nylon or polyester and 1680 denier ballistic nylon with content protecting foam padding for structure. 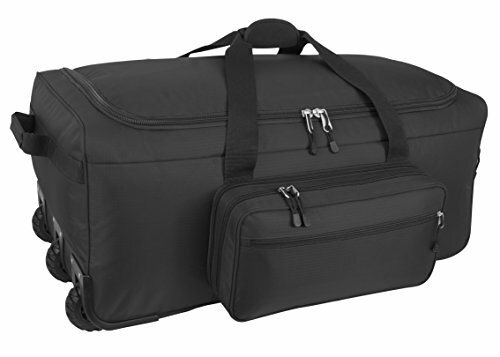 It features a modular internal compartment and a interior mesh zippered pocket, this Code Alpha Tactical Gear Mini Monster Wheeled Deployment Bag can fit everything you need and still obey airline industry limitations. A zip-off accessory/Dopp Kit is included. For a heavy duty and practical travel bag - or the ultimate deployment and TDY bag, bring along your Code Alpha Tactical Gear Mini Monster Traveling Luggage Bag. If you have any questions about this product by Code Alpha, contact us by completing and submitting the form below. If you are looking for a specif part number, please include it with your message.